Home » Asia » Angkor What? I’ll tell you. Angkor What? I’ll tell you. 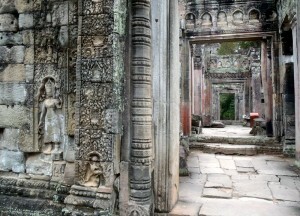 For me few places in the world hold more wonder and excitement then Cambodia’s Angkor Wat. 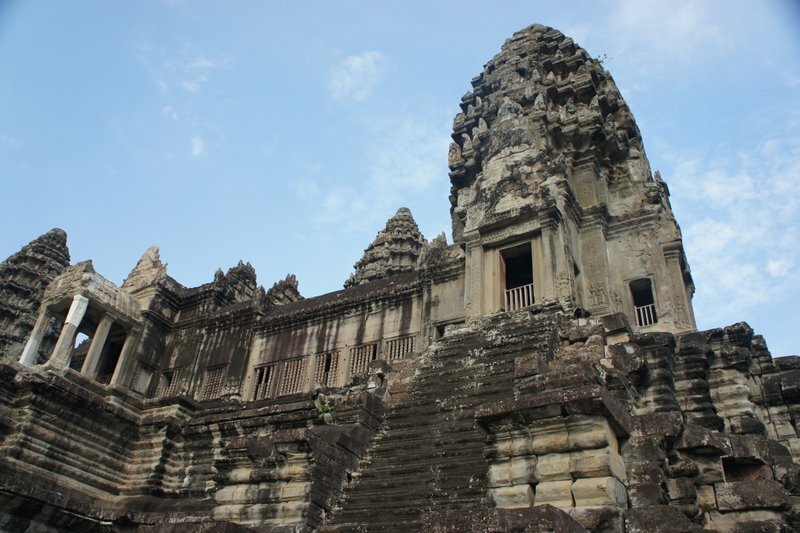 Over the years I had conjured up (in my head) quite a spectacular image of the temples thanks to movies like Lara Croft: Tomb Raider and Peter O’Tooles’s Lord Jim. I imaged strange spiked domes silhouetted by an intense orange sun. Their main structures slowly being strangled by the vines of a sweltering jungle. I imaged myself deep within the heart of an untamed Cambodia. 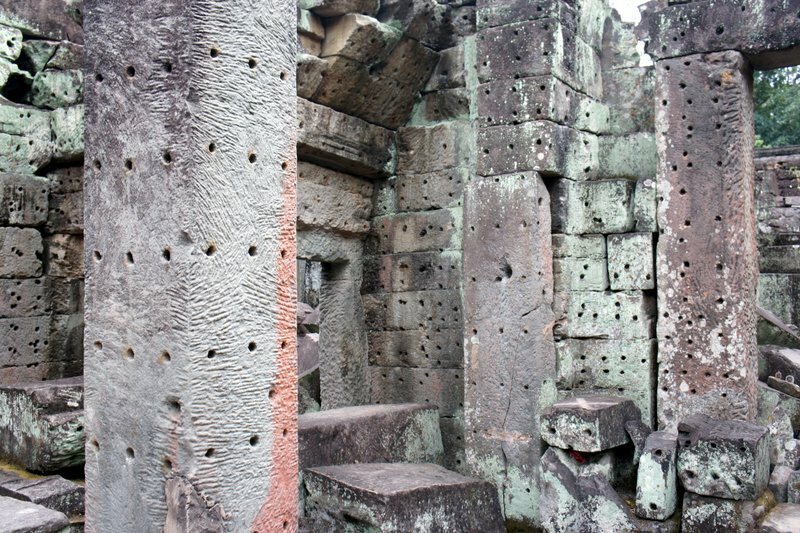 The temple grounds littered with land mines and heavily guarded by natives wishing to keep its treasures hidden from tourist eyes. I imaged restricted areas that could be cleverly bypassed by those with an adventurous spirit, where bizarre rituals passed down through the centuries still took place. Of course I had been to other ancient ruins during my travels and was perfectly aware of the inevitable swarms of tourists, vendor stalls, and excavation of the surrounding jungle, but those realities of tourism did little to spoil my fantasy. I found that if I squinted hard enough, I had the power to restore this mystical place back to it’s original splendor with alittle help of my over active imagination. Ben andi I’s adventure began in pitch darkness. Fumbling we felt our way along the seven headed serpent bridge that crossed the moat surrounding Angkor Wat. Our only guide, the occasional camera flash of an over zealous photog trying to capture the first streak of light to cross the sky. As the sun broke over head, Ben and I settled in to capture our first picture of the day. I was not disappointed. 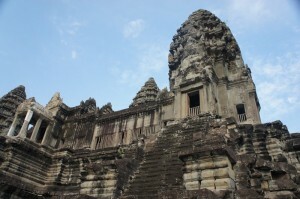 My first glimpse of Angkor Wat held with it a supernatural beauty that surpassed even my expectations. 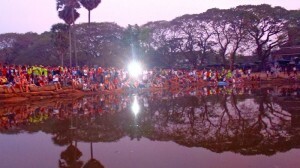 The refection pool in front of the temple was packed with tourists, so Ben and I decided to explore the inside. Tourism reality: swarms of photogs blocking reflection pool. The number of galleries, halls, court yards, and towers seemed endless. 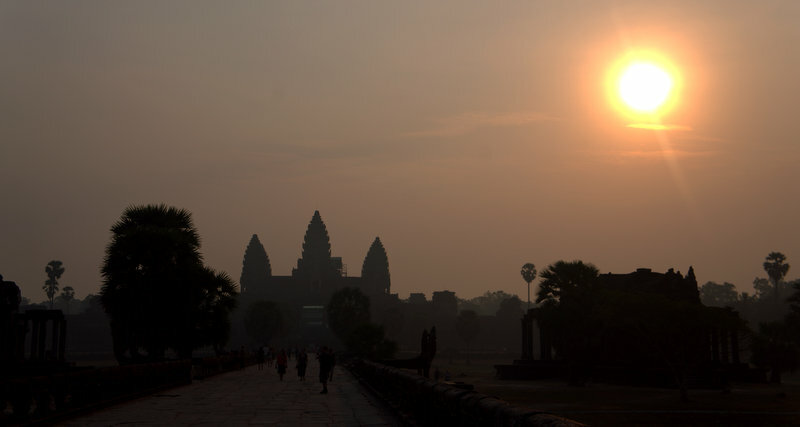 No wonder Angkor Wat has the distinction of being the world’s largest religious structure. Its floor plan is a miniature replica of the universe! Talk about ambitious. Built around the same time as Paris’s Notre Dame, it is the only temple at Angkor that has never fallen out of use and abandoned to the elements. Inside Angkor Wat: One of the it's many galleries. Window complete with headless Buddha. Temples represent mountains, court yards continents, moats oceans and so the layout goes. 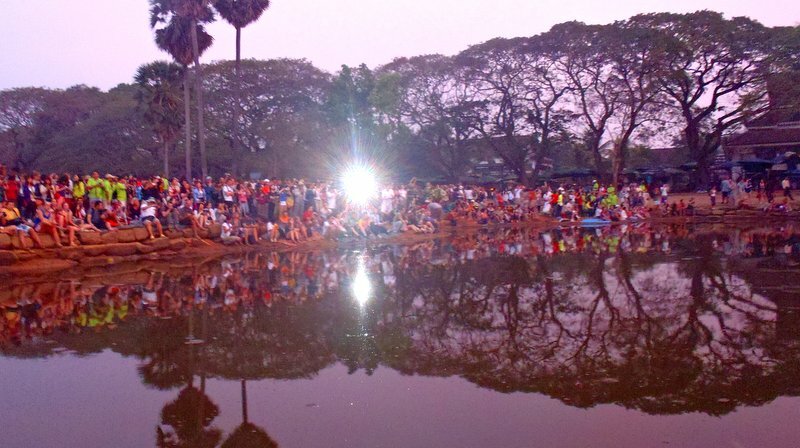 Revisiting the outside, we snapped the famous “Sunrise with Refection” picture of Angkor Wat and followed our original route back over the moat. This time with the rising sun illuminating what we missed the first time. Ahh the Angkor Wat at Sunrise, just as I imagined it. 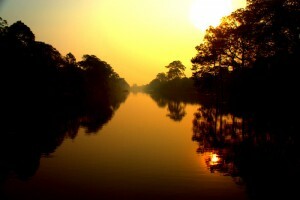 For more Sunrise pics go to the bottom of this blog. Our walk back over the moat. Ben faces the seven headed serpent bridge. 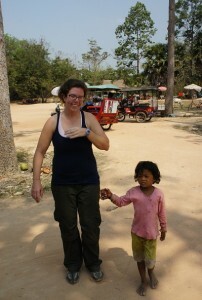 Next we crossed another bridge into the fortified capital city of Angkor Thom. Angkor Thom population was a staggering one million when England’s London was a small town of only 50,000. The bridge railings are devils and gods holding a giant snake, symbolically churning the ocean of milk to extract their elixir of immortality. One ugly devil: The Churning of the Ocean of Milk bridge. The light here is extraordinary. Have you ever felt like someone was watching you? 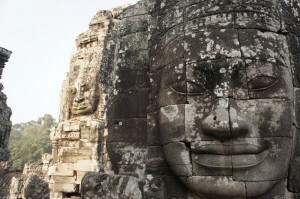 I certainly have after our visit to Bayon. 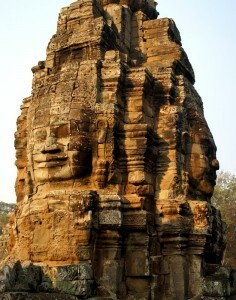 Not as famous as Ankgor Wat but in my option should be, its ingenious design actually made me uncomfortably smile back at the 216 enormous face that looked down on me! The god-king that commissioned this one definitely had one inflated ego. 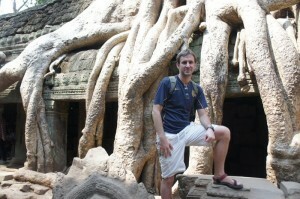 I like to rank things and this temple was number 1 for me, utterly fascinating. 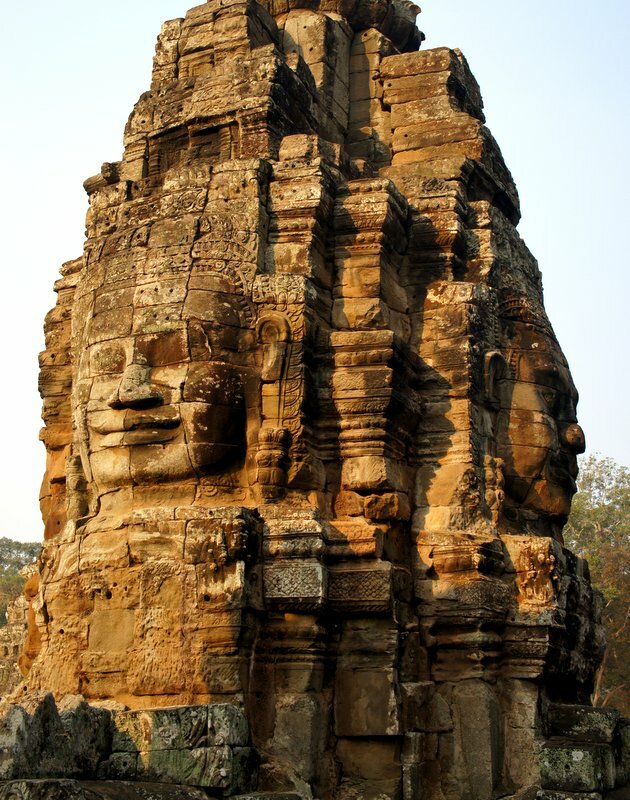 This temple has 54 huge towers, each with 4 faces. Each face coolie smiling down at me, unbelievable. 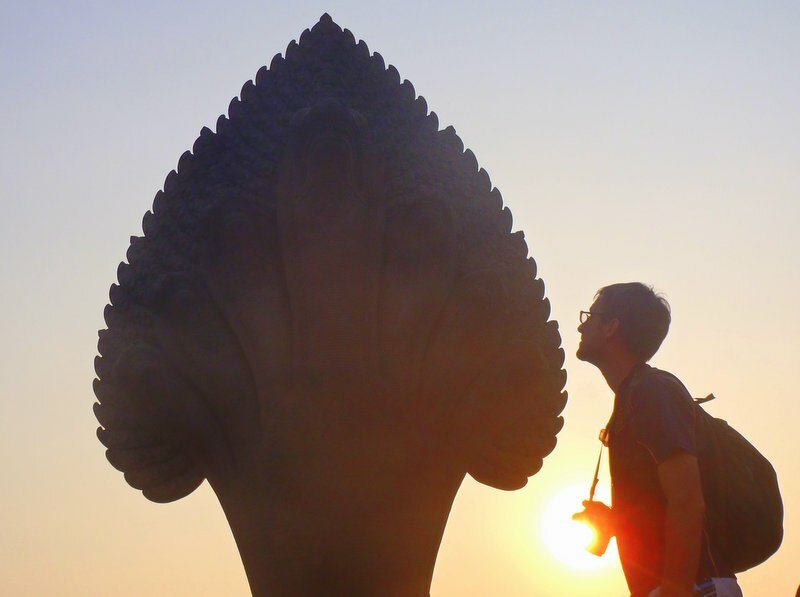 We visited many temples through the day most of the resembling 3D jigsaw puzzles of enormous size and grandeur. This photo was taken inside the top chamber of a smaller temple. It’s a testament to just how big these chamber really are! 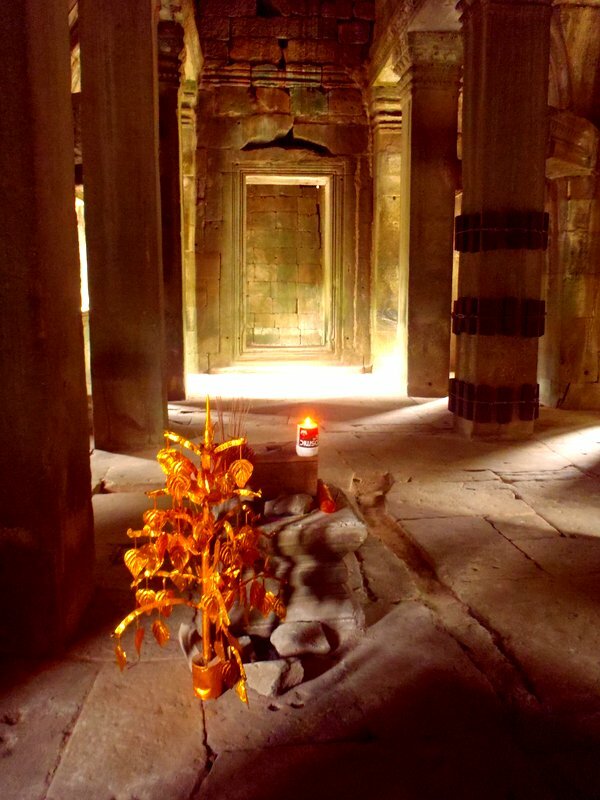 The smallest chamber in the smallest temple is not very small. 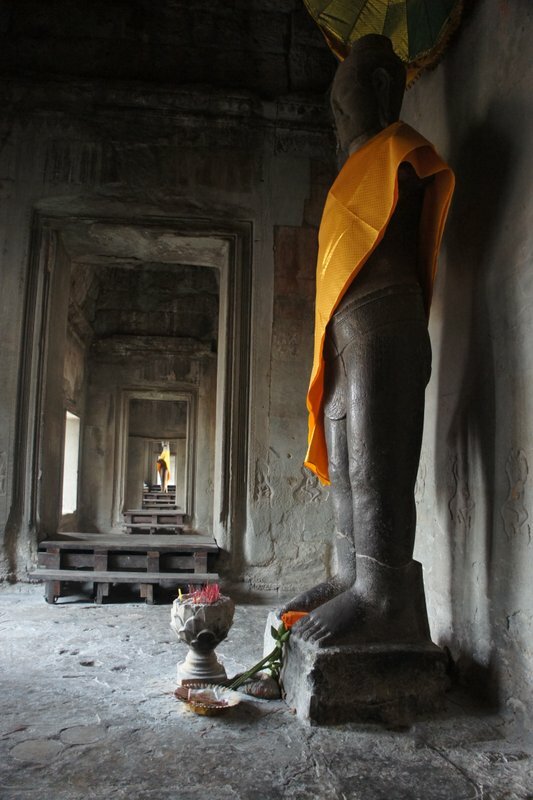 Buddha statues with orange sashes are abundant. Tourists are urged by vendors to make donations or buy incense. You are not obligated to if you don’t want to. Many vendors will persist, just be prepared to say “No Thank you”, alot. 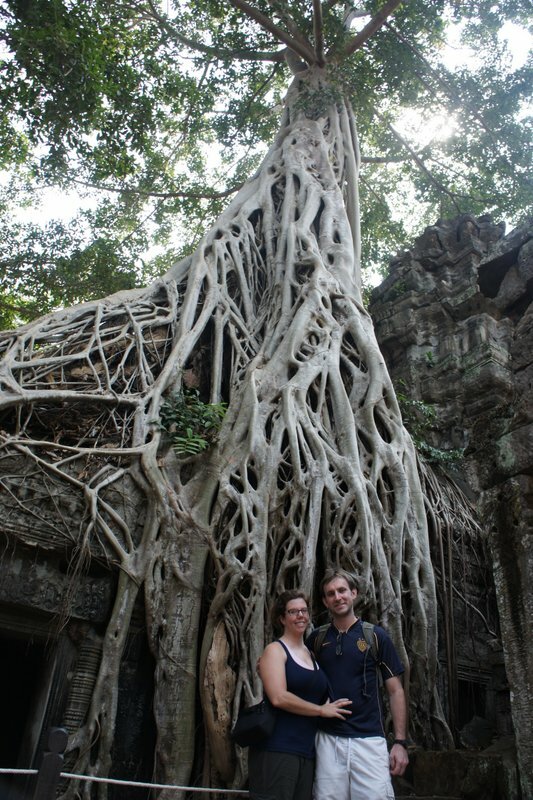 Another favorite was the “Tomb Raider” temple of Ta Prohm. 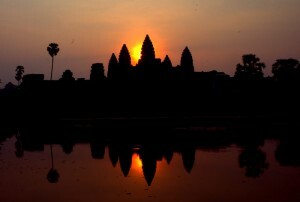 This is exactly what I pictured Angkor Wat to look like minus the bizarre ancient ceremonies. 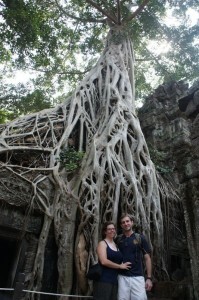 Here nature runs absolutely rampant and is just as much the star attraction as the temple itself. 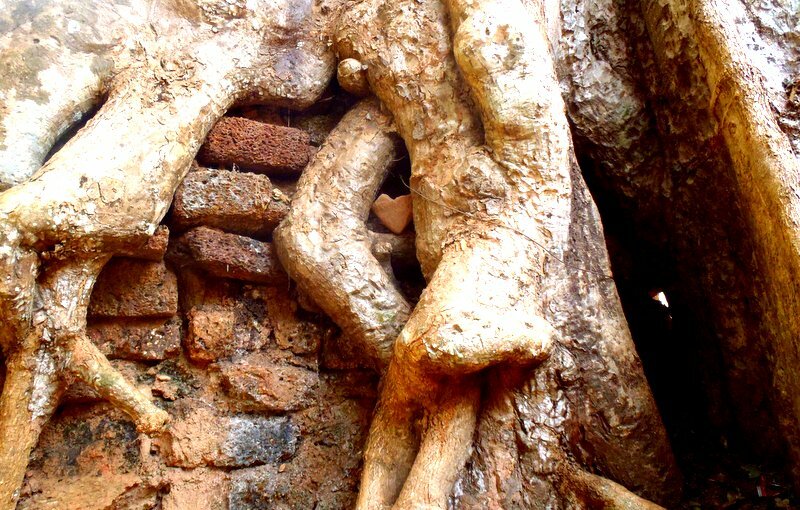 Mammoth size trees dig their branches and roots deep into the ancient stone walls in a millennium long embrace. I felt like I was trapped in a “Life after People” episode on the History channel. 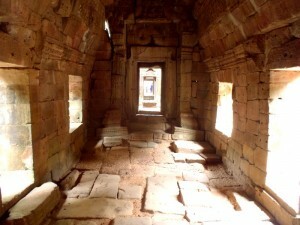 Walking through the corridors at Ta Prohm can be unnerving. 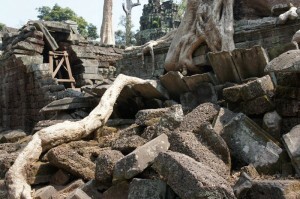 As you pass by piles of rubble, you wonder about your chances of being caught in the middle of the next collapse. Please don't fall down, Please don't fall down, Please don't fall down! 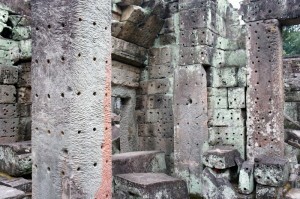 Another thing you notice as you walk through the temples are that there are holes everywhere. 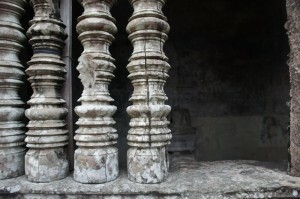 They are bore into the stone and they can be found high on ceilings and even on the floors. At first I though they were used somehow to transport the heavy stone bricks. But I was told by one of the guides that the holes once held rubies and emeralds. I can not imagine how beautiful this place once was. There are too many holes to even count! Holes for rubies, emeralds, and other gems. I wonder where they are now. The temples, carvings, and statues are magnificent. The nature and light superb. But behind national greatness and pride there is heart break. 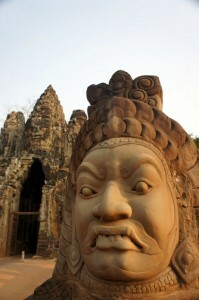 Cambodia is poor with a GDP per capital at a mere $2,215. 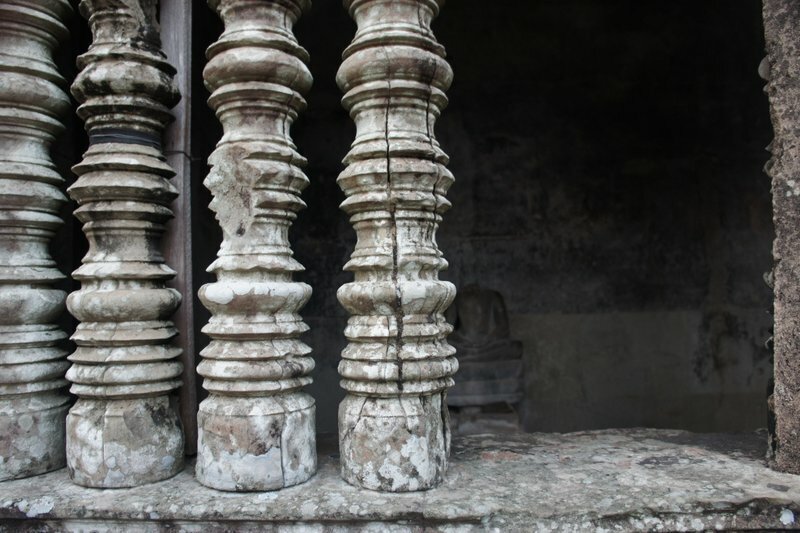 The sacred temple walls do little to protect it’s people from relentless poverty. It is an unavoidable reality here. At the end of every turn, at the entrance of every temple you will meet a pan handler or desperate vendor. The hardest to walk passed are the children. Crying "3 for a dollar." Parents often keep children out of school in hopes they will make money for the family. 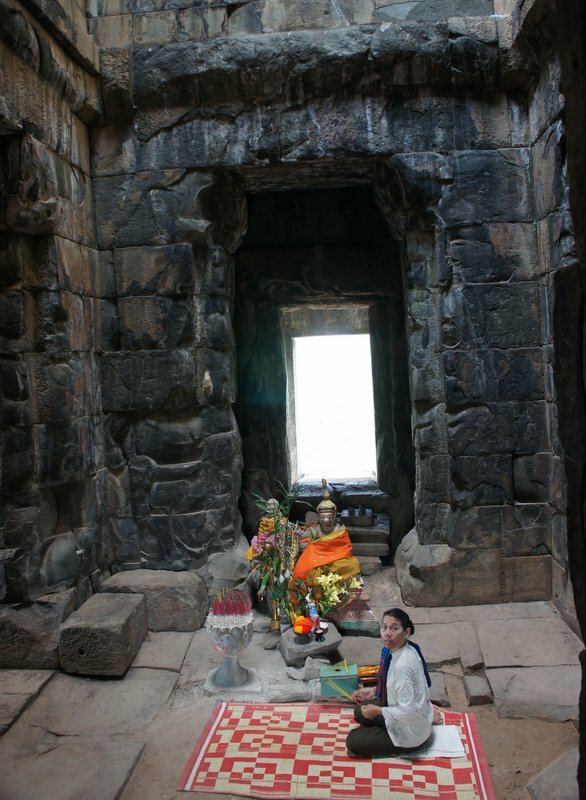 Cambodia is one of the most heavily mined countries in the world. Estimates are close to ten million mines. The intense presence of landmines are not part of some Indiana Jones fantasy, but are very real and very eminent threat to these people. Landmine victims often play music outside major temples for money because there is little work they are physically able to perform. If you want to give money to a worthy cause I suggest this one. They often want to work but can’t and in my opinion their traditional brand of music positively adds to the over all visitor experience. Any donation amount is accepted with heart warming smiles. I can’t help but post these. Here are two of my Angkor Wat favorites! Enjoy! Amazing pics, beautifully written! It is so fun to see this through your eyes! You two are so lucky to have this opportunity to explore. Thank you for sharing with us…..